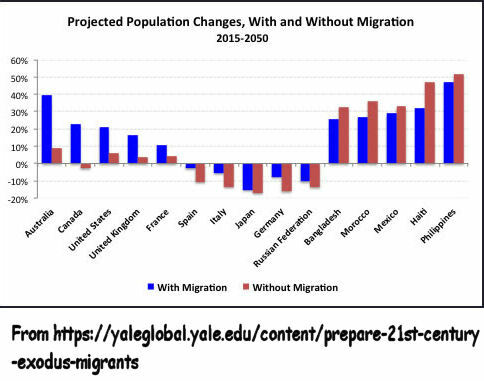 YaleGlobal announces: "Prepare for the 21st Century Exodus of Migrants ... Cross-border immigration accounts for much of the population growth in developed countries with low fertility rates. Such immigration has also become an election issue around the globe." Unfortunately open borders are being promoted in order to maintain constant population growth; the 'developed world' ideas managers are not really trying to avert this disaster. 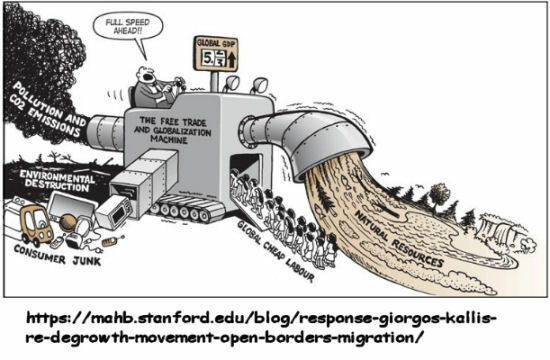 "If those taking steps necessary to migrate were to immigrate to desired destinations, the result would expand UN-projected annual numbers for major migrant-receiving Western countries by more than tenfold," writes Joseph Chamie, (this Yale article). That would mean immigration at about 2.5m every year in Australia, or about 10% of Australia's current population. This would have Australia's population initially doubling in 10 years, but of course it would then grow faster and faster, due to compounding natural increase and an increasing population base! 75% of Australia is rangelands and arid desert, similar to North Africa. Australia's politically engineered immigration-fed population growth rate is already overwhelming its infrastructure. The increased demand means money for developers, but increased prices for most people. Reading Chamie's article makes me again wonder whether modern economics has actually confused people with dollars. Joseph Chamie first launched these ideas via the UN in 2000, “Replacement Migration: Is it a Solution to declining and Ageing Populations,” 6 January, 2000 and for the final report, released on 22 March 2000. At the time it was received with laughter from demographers in Europe, but taken seriously by absurdist economists in the Anglosphere. The absurd is now becoming reality, constantly promoted in the corporate press. The process promoted is more dangerous than Hitler, because demographic inertia has a life of its own and engineering population age-cohorts to balloon is nuts. The idea is to constantly increase world population numbers in guise of maintaining youth cohorts at the same unusual proportional levels as they were at the time of the 'Baby-boomers' and cheap oil. This plan would lead to grotesque distortions in demand and individual survival that business people, naive about the numbers, imagine would keep them rich. Indeed, a small number of elites and corporates who control resources, would become even richer than today - for a short time - but at these rates of growth, the world's capacity to feed itself and remove waste would collapse - very quickly. It is never clear to me whether Chamie is advocating this horror-scenario or trying to warn the world. Either way, he is failing, because most people simply have no idea of the numbers and those who suspect the numbers, cannot believe that their 'leaders' would do this to them. As an evolutionary sociologist who writes about human and other species population dynamics (Demography Territory Law: The Rules of animal and human populations), I find it remarkable that the economists and demographers most seen and heard in the mainstream media, think that disproportionate youth cohorts are a good thing. They seem to be operating as if the laws of nature had been entirely suspended by the laws of finance. If anyone wants to read more about Henri Leridon's analysis in English I have republished parts of his texts most recently in an article called, "The plan to flood Europe with migrants - UN 2000 report," at https://www.candobetter.net/node/5579. With regard to the population growth in the 'developing world', the replacement of traditional economies with cities is the cause of overpopulation and this has been made possible by modern transport. It has brought greatly increased fertility opportunities to peoples and tribes that were previously limited by endogamous restraint in viscous populations. Everyone and every creature once lived in viscous populations. Immigration factors has been magnified by new transport technologies, all over the world. We need to preserve and promote viscosity everywhere we can, not more and more cities and population movement. If turbo-charged capitalism had not got control of world ideation, this might be possible. Henri Leridon, “Vieillissement démographique et migrations: quand les Nations unies veulent remplir le tonneau des Danaïdes...”, Population & Sociétés, No. 358, Juin 2000. It's pretty tragic when a group of poorly informed people can advocate or facilitate a time bomb such as contemplated- the increase of immigration levels in receiving countries by a multiple 10. The consequences are simply too dire to write this off as a mere "thought bubble' even though that's about the right status of the brainstorming that came up with it. Well summed up, Quark. You have an amazing ability to correctly simplify apparently complex policy processes. Around 11.20 today, Friday 18 September 2018, on ABC radio Jon Faine show. I heard an elderly man on the phone trying to explain Al Bartlett's population doubling to JF.. The man quoted Al Bartlett that the downfall of humanity was the inability to understand the exponential function. JF's retort was "What are you going to do Joe (or whatever his name was ), have a one child policy or compulsory euthanasia at 80? " the man said that he did not have the answer and that he did not think JF's suggestion was a goer. With people like Jf dominating the air waves - what hope is there for sensible discussion? Take 2! And thankyou Aunt Kittie for your analysis of the appalling state of the mainstream media. If you dare raise a subject that is (in their eyes) anyway contentious and if you don't support their point of view, you shall incur their wrath in spades. The question may be asked: Why do our governments, the majority of big business and the mainstream media support rampant population growth?? Even Boy Wonder knows the answer to this one. This is greed and denialism of the worst kind and unfortunately the poor, those with disabilities, the young and the old are the first affected by it. Mankind is facing a confluence of tragedies as overpopulation is driving climate change, social upheaval and war leading to mass migration and an economic armageddon where water, food, jobs, housing, health and education for the rich will prevail. The Australian way of life, the land of a fair go, will become a memory, a figment of our imagination. As of August 31 19% of our workforce were looking for work or more work according to Roy Morgan Research*. That equates to 2.547 million Australians that are struggling to make ends meet, life for them ain't easy and it won't get any better under the current political regime. Added to that miserable figure is the fact that around 20% of our youth (18-24yrs) are looking for a job. And this is on the so-called upside of the economic cycle. Little wonder that violence and drugs are continually making the news. Idle hands and minds are a fertile breeding grounds for criminal activity. Then we have reactive governments buying votes by being tough on crime, waging a war on drugs and losing both! Why don't our so-called elected representatives do something constructive and stop importing humans, provide jobs by building the infrastructure to accommodate all Australians and begin to address climate change before it engulfs the planet. But then again it we who elect these so-called representatives, so why don't we do something about it?? Comment from Phaedra was accidentally deleted!! Can you please re-post?